Each round, players take turns allocating their workers (cool-looking meeple with Russian hats) to various actions on the main game board. For example, players can lay track which advances the relevant matching colour rail marker(s) along any of the 3 routes on their player boards. There are 5 colours of track marker in the game (each route requiring a different mixture of track marker colours) but these colour markers are not allowed to pass one another or occupy the same space, so this means you need to consider the order in which you advance the track markers too. Players can also use workers to build and upgrade locomotives that are placed on the rail routes. Having rail markers and locomotives reach certain spaces along these routes unlocks various positive items, like extra workers, bonus scoring, etc. Players can build factories – the factory tokens look cool as they neatly slot into the notches at the bottom of the player boards. Plus, players can use actions to advance their industry marker along the industrialisation track; however, this track has gaps in it which are only filled-in and passable when factories are built, so a player must build factories if they are to advance their industrialisation. Moving an industry marker onto a factory allows the player to instantly use the factory’s ability. The player board showing the 3 track routes. Factories are inserted into all but the final slot along the bottom. 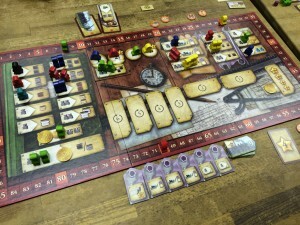 There are engineer tiles on the main board which each have an action and these engineers change as the game progresses. Two engineers are available each turn and any player can use the actions by placing workers like normal action spaces. Plus, one player can hire one other engineer each round and that engineer remains with the hiring player giving them their own special (private) action to use in later rounds. Engineers can earn points at game end too. There are a few extra actions too which can earn things like extra roubles (required for some actions and can replace workers too), temporary workers, change turn order, etc. Almost all actions can only be used by 1 player each round so players need to pick carefully and watch where other players are placing their workers too. At the end of each round, players score points for their 3 railroads and industrialisation. Points from railroads are based on first x spaces where x is the level of the locomotive(s) on that track, and each space’s score is based on the most valuable colour track marker that has reached that space (with later track colours scoring more points). So, laying track over a long distance is of little use until you only have a high-enough numbered locomotive. Players score points for how advanced their industry marker is too. At the end of the game, players score points based on any bonus cards they may have, and having the most or second-most engineers too. Russian Railroads is an excellent, meaty eurogame with many tough decisions. There are lots of possible ways to earn points but spreading yourself too thinly across these options is unlikely to score as much as focusing on just a few options. So, not only do you need to find a good combination of actions to maximise your progress and scoring, but this is a game of worker placement too so you need to secure the actions you desire before other players use them too. Each player board has various elements that, when reached, unlock other items like gaining extra workers and higher value track markers. However, one of these elements is especially powerful – the special bonuses – and each player board has 4 locations where these can be earned. When a player unlocks a special bonus, they pick 1 of the 7 possible bonuses (each player has their own set of these and can only ever take each one once). These are all very positive but some will obviously combine better with a player’s plans than others. If timed right, these can really boost you along with major gains and/or lots of points – sometimes they can unlock another special bonus. Each action is short, so there is little down time during the game. Player interaction is in the form of the worker placement for actions. As the actions are critical, and some have no other alternative way of gaining them, you should expect many times when players ‘humourously’ get in each others’ way. As a result, one of the game’s challenges is to find a way to make progress when the actions you planned to take are not available – hiring an engineer can be extremely valuable in this regard as it gives you an action that only you can use each turn. However, sometimes you just need to know when to switch your overall strategy completely, rather than hang on to one that isn’t working in the hope that it will (which sounds like a lesson in life). 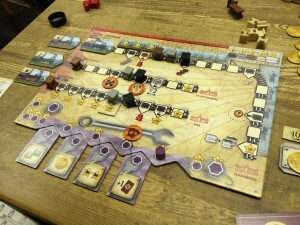 I have played Russian Railroads with 2 and 4 players and found it worked well for both. The main board is double-sided and one side is especially for 2-players with fewer action areas. So, don’t expect any less of a challenge when playing with 2 players. None of the rules are complex in themselves but there are a lot of elements to balance. Doing anything in Russian Railroads will make progress but it requires a strategy to really do well. 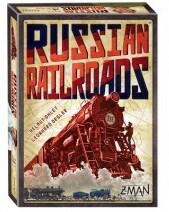 As a result, it’s not a game for inexperienced gamers; however, for more experienced gamers though, Russian Railroads is a challenging and rewarding game with plenty of opportunity for strategy, as well as re-thinking that strategy when the actions you wanted weren’t available and you need to quickly find a new approach. Physically, the artwork looks really good with excellent boards, a great cover, and clear iconography too. The pieces, cards and boards are all high. A random selection of the engineers are used each game, and in a random order, so that will a little variety to replay – although that is the only thing that changes from game to game. 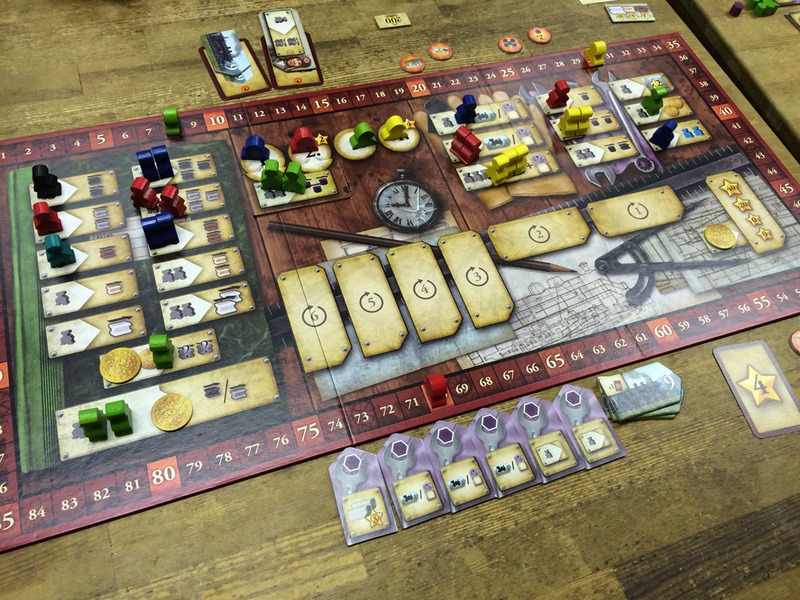 This entry was posted on Monday, December 2nd, 2013 at 2:24 pm	and is filed under Board Game Review, Board Games, Essen Spiel 13, Russian Railroads, Spiel 2013. You can follow any responses to this entry through the RSS 2.0 feed. You can leave a response, or trackback from your own site.